For more than two decades, sitcoms produced by the prolific Chuck Lorre — a list which includes The Big Bang Theory, Two and a Half Men, Mom, Young Sheldon, Mike & Molly and Dharma & Greg — have ended with a special “vanity card” where the producer shares some stream-of-consciousness thoughts. These vanity cards can be a picture, a multiple paragraph essay, or something even more controversial. And they all come and go within a second. Some of these vanity cards were collected into a book in 2012. Called What Doesn’t Kill Us Makes Us Bitter, it’s a bit of a collectors item now, fetching high prices on Amazon.com. Proceeds from the book benefited many health care–related charities and educational efforts, including the Venice Family Clinic. You can find the entire collection of vanity cards online at www.chucklorre.com, as well. 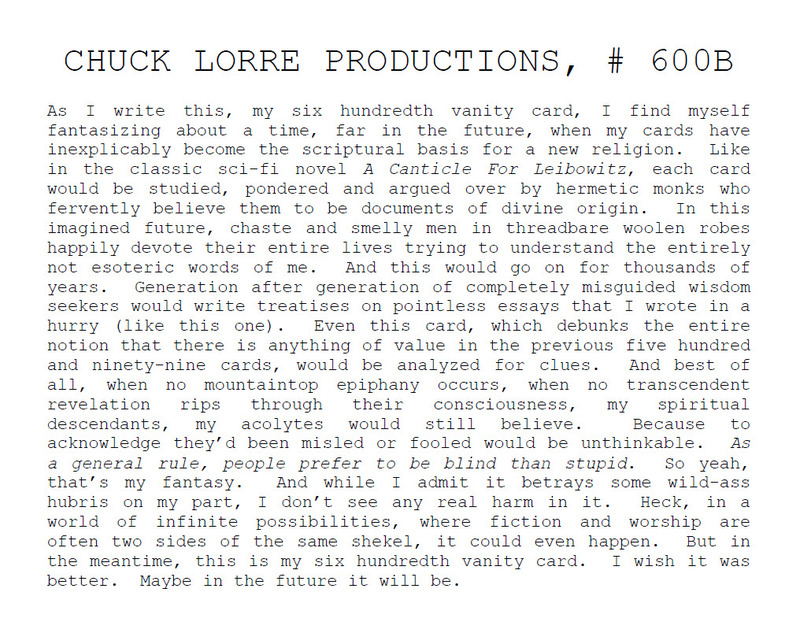 Tonight (November 8) Lorre posted Vanity Cards #600A and #600B. The first, aired after The Big Bang Theory, is a picture of Sheldon Cooper and “Old Lady Green Beans.” The second, airing with Young Sheldon, has the producer speculating on what these vanity cards will mean when people look back in the future. You can see both of tonight’s cards below. In its 12th and final season, Chuck Lorre’s hit series The Big Bang Theory airs Thursdays at 8/7c on CBS. Young Sheldon, currently in its second season, airs Thursdays at 8:30/7:30c on CBS. Mom, now in its sixth season, airs Thursdays at 9/8c on CBS. Lorre’s next show, The Kominsky Method, premieres on Friday, November 16, on Netflix.